the Schumacher years of F1 were pretty epic. those screaming V10's and the Ferrari buzz was pretty wild. I am a fan of all those things. I am very grateful to have attended every year of the USGP Indianapolis. nice to hear! yeah for some reason I never developed any animosity towards any drivers. I appreciate all those top guys, just because what they do is so crazy. And, saying they won because of the cars they were driving... sure it might have been a factor, but don't use it as a discredit to the driver. However, you cannot discount that during his reign years in Ferrari, the peeps from Modena/Maranello piled in more $$$$ into F1 than ANY other team...the Ferrari carts had a definite advantage over the competition. That may be true, but you are forgetting (or ignoring) how he joined the team (that was not doing so hot) and changed the dynamic there. The unbelievable attn to detail, the new level of fitness he employed, making sure they had the best people for every aspect of the operation, etc. How he integrated his mechanic knowledge he picked up in his younger years to work into the wee hours of the morning with the engineers to extract maximum performance from the car. The whole, "they threw the most money at it" point isn't looking at the whole picture. Look at how that turned out for Toyota. Money is very important of course, but there's more to "it" than just that. Schumi played a big role in his own success at Ferrari, including how good the car itself was. Hey, no argument here on his skills/talents. His surgical precision and attention to detail was arguably peerless during his racing years. And your points are exactly what makes the discussion about his career somewhat a deep rabbit hole. Put it this way, as great as he is, I've always looked at him like how I viewed the NY Yankees during their dominate years. You can't say those teams had no skill...because, with all that $$$$ spent to put together that roster, it still comes down to the ball team to execute. Same thing said here for Ferrari and Schumi. Great driver...but, he was not favorite. That's all. This is so so true, people tend to forget quickly how dysfunctional and broken down Ferrari was in the mid-90's. Besides the cars not being competitive the structure and organization of the team was also quite bad. Jean Todt got hired and his first task was to hire a #1 driver who could help rebuild the team/car/organization. After hiring Schumacher (where he had to struggle with a poor handling Barnard chassis and low power motor), he went on to 'poach' Ross Brawn and Rory Byrne from Schumacher's old Benneton team. The Todt/Schumacher/Brawn/Bryne combo went on to transform the Ferrari racing team from the top down and bottom up literally. Everything from engineering to race strategy was subjectively reviewed and overhauled. Schumacher was instrumental along with the others to getting all those amazing records and results. terrible if true but I'll save my judgment for when someone other than SI writes about his condition. Last edited by Chief F1 Fan; 03-09-2014 at 05:53 AM. Interesting. They must have dropped the story. Maybe that means the news they reported wasn't accurate. Let's hope. There are so many different opinions from so-called experts that IMO nothing that isn't from the word of his agent/doctors is worth anything. And there has been nothing from them, so no reason to worry or get excited. These articles seem to just be looking for views through shock value. Every report saying he isn't going to recover or he's going to be a fragment of his former self is conjecture, even if the speaker is an "expert." Michael Schumacher's family have made the first positive statement regarding the condition of the Formula One racing legend since a tragic skiing accident late last year that required doctors to put him in a coma in order to treat blood clots in his brain. "We are and remain confident that Michael will pull through and will wake up,” Schumacher's family said in the statement. “There sometimes are small, encouraging signs, but we also know that this is the time to be very patient." After the accident at a French ski resort on December 29, Schumacher was rushed to nearby Grenoble University Hospital Center where he was put in an induced coma and had surgery performed to treat haemorrhaging in his brain. Doctors started the waking process in late January, a process that they say can take a long time and is ongoing at present. "We are and remain confident that Michael will pull through and will wake up. There sometimes are small, encouraging signs, but we also know that this is the time to be very patient. Michael has suffered severe injuries. It is very hard to comprehend for all of us that Michael, who had overcome a lot of precarious situations in the past, has been hurt so terribly in such a banal situation. It was clear from the start that this will be a long and hard fight for Michael. We are taking this fight on together with the team of doctors, whom we fully trust. The length of the process is not the important part for us. It is heart-warming to see how much sympathy his family is shown and I can say that the family is extremely grateful for it. However, it should not be forgotten that Michael's family is dealing with an extremely intimate and fragile situation. And I would like to remind all of us that Michael has always actively kept his family out of the public eye and consequently protected their private lives. We try to channel all the energies we have toward Michael and we firmly believe that this will help him. And we believe that he will also win this fight." If/when Schumacher wakes up, it'll be glorious. Formula 1 champion Michael Schumacher is reported to have lost 25 percent of his body weight since doctors placed him in an artificially induced coma to help him recover from brain injuries sustained in a skiing accident last December. Schumacher’s weight had dropped from twelve stone to just under eight and a half stone in the 83 days since he was placed in a coma, according to reports in German media. “Weight loss in coma patients is normal,” Professor Dr Kurt Diehm, a coma expert at Germany’s Karlsbad teaching hospital told Bild. “One must assume that his muscles have degraded considerably because of his immobility,” he added. The 45-year-old suffered a serious head injury after striking a rock during a skiing accident in the French resort of Meribel in late December. He is being treated at a hospital in Grenoble where his family including his wife Corinna, is maintaining a bedside vigil. Officially, the injured driver is now in a “wake-up” phase as doctors gradually reduce his drug intake in an attempt to bring him out of his coma. Yet signs of a recovery have been minimal. “His family is incredibly strong, they won’t let themselves be discouraged,” the driver’s manager Sabine Kehm earlier this week. She added that Schumacher was is still in a “wake-up phase” and stressed that he had not yet woken up. “We are still waiting for this to happen but we have learned to accept that it can take a long time,” she added. Doctors are reported to have told Schumacher’s family that the driver’s chances of recovery are minimal. Last month, Germany’s Focus magazine reported that complications had obliged doctors to halt Schumacher’s wake-up process and that the driver had been put back into a coma. Schumacher’s management team denied the report. 25 pounds in 3 months doesn't sound terribly bad. Schu's weight is being reported as "8 stone" which is the equivalent of 112 pounds. I'd wait for someone else other than the DailyMail to report a story on Michael's condition. I know but the doc they're quoting is the former head doc for the FIA. Kind of hard to ignore that. But all he's really doing is bringing up a now moot point (the airlift issue) and taking vague potshots at his physicians. A manager for Michael Schumacher has revealed some good news today about the condition of the injured Formula One legend, saying in a statement that Schumacher has started showing some moments of consciousness. 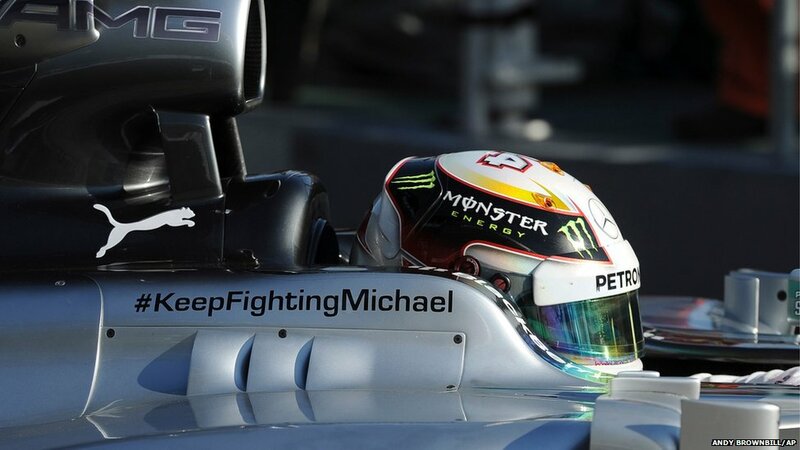 "Michael is making progress on his way," Schumacher's manager Sabine Kehm said in the statement. "He shows moments of consciousness and awakening." Kehm added that Schumacher's family remain confident but are hesitant to disclose further details due to privacy and to ensure the medical team can work in full calmness. Schumacher, 45, is being treated at Grenoble University Hospital Center in France where he was put in an induced coma soon after his fall and had surgery performed to treat haemorrhaging in his brain caused by the impact of his head on the rock. Some of the clots were inoperable because they were too deeply embedded in his brain tissue. Doctors started the waking process in late January, a process that they say can take a long time and is ongoing at present. Now, three months after his skiing accident in the Alps, media reports are coming through that Schumacher is responding to voices and making eye contact with others at the French Grenble University Hospital. Italy’s La Gazzetta dello Sport reports that Schumacher is making encouraging eye movements and Germany’s Bild am Sonntag newspaper says he is responding to voices. Former Formula 1 driver and close friend of the family, Jean Alesi, has visited Schumacher many times since the 45-year old German’s accident and says that the news is much more encouraging. “First, Michael responded only to pain, when he was pinched for example,” said Alesi in a report by Speed Week. “But that can also be an unconscious reaction of the body. Former Ferrari teammate and close friend of Schumacher, Felipe Massa, seemed to confirm at Bahrain that Schumacher is responding to voices. Ferrari drivers and staff have gathered to send a message of hope to Michael Schumacher and commemorate his first Formula One victory at the Spanish Grand Prix with the team he led to five world championships. Drivers Fernando Alonso and Kimi Raikkonen flanked new team principal Marco Mattiacci among about a hundred team members in front of a sign saying "Remembering your first win with us #forzamichael." Schumacher suffered a serious head injury in a skiing accident in December and was placed in a drug-induced coma. In April he showed some signs of consciousness. Schumacher won his first race with Ferrari in 1996 in Montmelo. He went on to win five of his seven world titles with the Italian team. Last edited by Legend2TL; 05-12-2014 at 11:21 AM. I hope the future bodes well of course for Schu and that this recent development is as good as it sounds.